Beth Kanter is perhaps the best-known, most-respected voice in the world on the subject of using technology in a non-profit setting. A consultant to non-profits since 1993, her blog is consistently ranked as one of the best in marketing – and for good reason. It’s full of the kind of practical, tangible, viable advice that all organizations (not just non-profits) need in these crazy days of social media. Named by Fast Company Magazine as one of the most influential women in technology, Beth participated in a live Twitter interview on July 14, 2009, covering a wide range of ideas and best practices for harnessing social media for social good. 1. @jaybaer: Does social media represent an evolution for non-profits, or a revolution? Does it change the game? @kanter: In some ways, a revolution because it requires a change of culture to adopt in some cases. 2. @jaybaer: Is social media better used to humanize non-profits to create understanding of their services, or better used to mobilize? @kanter: I think both and that order, humanize first, mobilize second. You have to develop relationships first. 3. @jaybaer: Does social media work better as a campaign for non-profits, or as an ongoing program? @kanter: It needs to be an ongoing relationship building effort – versus campaign. To be effective you build your network. You need to avoid treating supporters/donors like ATM machines. 4. @jaybaer: Is the messenger as important as the message? Seems like the asker is a critical component in social media for social good. @kanter: Yes, but I would not use word “messenger” — perhaps network weaver, community builder, evangelist, fan is more accurate. 5. @jaybaer: To that end, many people struggle with blending of personal/professional. Isn’t that blend required for personal appeals? @redcross strategy is brilliant – encouraging people to be ambassadors, provides personal guidelines. 6. @jaybaer: Social media levels playing field, but w/ so many NPOs jumping in, does it create dissonance for donors? How do they parse? And the cure is to get back to relationship building, and building the network before it is needed. 7. @jaybaer: Similar to what’s happening w/ Social CRM, do you encourage NPOs to add social media interactions to their database? How? @kanter: Social CRM for nonprofits – it’s in the early adopter stage – those that have their CRM in good shape have a leg up. There is a nonprofit version of salesforce, I suspect that will be a solution for some. 8. @jaybaer: Do you see local NPOs generating more out-of-market connections & donors due to social media outreach? Is that a benefit? 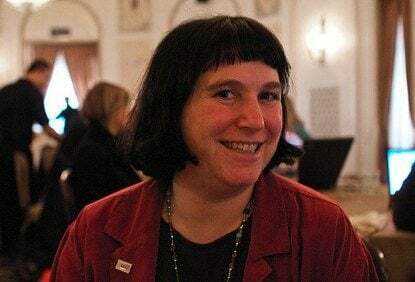 @kanter: Yes, local NPOs generate new donors, connections via social media – a key benefit. 9. @jaybaer: How do you feel about Facebook? Seems a natural for many NPOs. Concerns about too many eggs in that basket? 10. @jaybaer: I’m seeing some NPOs neglect their Web presence due to excitement about social media. Do you agree? Remedy? 11. @jaybaer: Most NPOs are resource constrained. Yet, social media requires a lot of blocking and tackling. How do you make it work? @kanter: Suggest starting slowly, incrementally with listening 5 hours per week. I suggest don’t do it if you don’t have time. About the time issue, here’s a post I wrote a while back re: time – it is still relevant. 12. @jaybaer: You write a lot about matching social media tools to the audience. How can NPOs best do that research? Donor surveys? One good thing for nonprofits, there’s lots of free research available. 13. @jaybaer: Social media is inextricably linked with inbound marketing. How important is search engine savvy for NPOs today? @kanter: SEO is very important for nonprofit marketing plans – part of the rule of thirds (Web site, social media, SEO). 14. @jaybaer: NPOs have a lot of interactions w/donors & customers. It’s not perfect. Should NPOs have a social media crisis plan? 15. @jaybaer: You’ve done a lot of work and contributed to a lot of wikis. How can orgs use wikis and crowd-sourcing more effectively? Better use of wikis with nonprofits – the big thing is that wikis need facilitation, a wiki gardener or 6 core people. Here’s my best advice re: being a wiki gardener. 16. @jaybaer: Much of your wiki is great stuff from your head. Some consultants fear giving away the “secret sauce” for free. Not you? @kanter: I’ve found that openness and giving away knowledge leads to more opportunities. I’m a Creative Commons advocate – some more thoughts on setting ideas free. @kanter: Still waiting for the publication! Key takeaways = a critique of the interaction design and better strategy for NPOs. This post sparked the chapter I contributed. 18. @jaybaer: You speak at a lot of conferences. What makes a great event these days? @kanter: Great speakers, lots of interaction, creative use of tech (e.g. backchannels), and networking opportunities. 19. @jaybaer: Congrats on being named 1 of the most influential women in tech by Fast Company. Richly deserved. How does that feel? @kanter: Re: Fast Company – felt great to get kudos, but also wanted to give kudos to others. @kanter: Been working as scholar since March – here’s a blog post about it. It’s been an amazing learning experience. Wow. By FAR, the most links to other amazing resources of any Twitter 20 interview to-date. It’s like an interview and wiki mash-up. Great job by Beth Kanter. Thanks to all who tuned in. What was your favorite answer by Beth? Mine was “Facebook is a friend raising tool, not a fundraising tool.” I’ll be using that one again. You?